I found this delicious cupcake recipe in Taste of Home magazine. 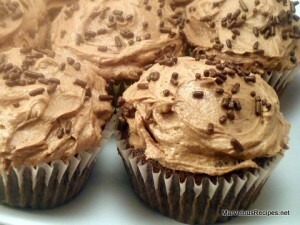 I love the rich chocolate frosting that tops these moist and yummy cupcakes! My hubby likes them best without frosting! In a large bowl, cream butter and sugar until light and fluffy. Add eggs, one at a time, beating well after each addition. Beat in vanilla. Combine the flour, cocoa, baking soda and salt. Combine buttermilk and water. Add dry ingredients to creamed mixture alternately with buttermilk mixture, beating well after each addition. Fill paper-lined muffin cups two-thirds full. Bake at 375 degrees for 15-20 minutes or until a toothpick comes out clean. Cool for 10 minutes before removing from pans to wire racks to cool completely. For frosting, in a small mixing bowl, beat butter and confectioner’s sugar until smooth. Beat in the melted chocolate, milk, vanilla and salt. Frost cupcakes; garnish with chocolate sprinkles. Yield: 2 dozen. Yum! I’m always looking for a new chocolate cupcake recipe, you can never have enough, and these look great. Thanks for joining in the fun at Cupcake Tuesday! These look absolutely yummy! And my husband is the opposite of yours…the cupcake would just be an easier way to get to the icing! I bet they are so moist!